Does Wisconsin need an ECAC? I was thinking about the fact that the City Conference had only a few teams competing and the Six Rivers, Ridge & Valley and M&O conferences each have three or less schools. ECAC ends up being a catch all conference and also stated in the first part of this post is that most members belong to at least one other conference. 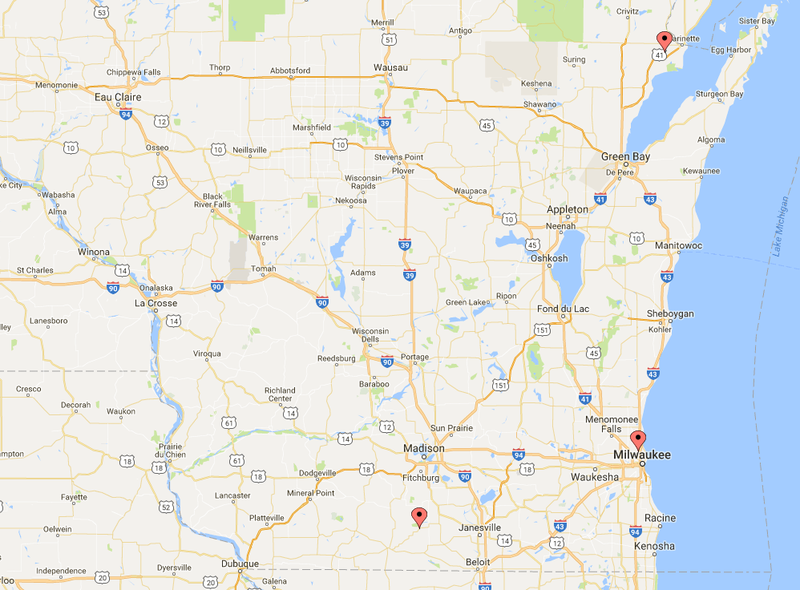 Below is a map with Albany, Milwaukee King and Peshtigo plotted (click to expand). If every year schools with lesser turnouts for conference pinpointed a host early on – let’s say Fond du Lac, Oshkosh or Sheboygan this year – all of the teams could compete in an actual conference meet. I don’t know much about the other conferences but the “City” Conference for XC was disappointing to watch with only 3-4 complete teams. Coach Zeise works hard to keep the programs afloat and as somebody said he is an “MPS Warrior”. The unfortunate part is that there are to many schools who co-op and it’s hard to build a since a pride. Here you have I think 7 schools that are combined and they may not even be a complete team by sectionals( Milwaukee Samuel Morse.Marshall/Carmen Northwest/Languages Madison/Obama SCTE/Vincent/Washington). There was supposed to be another 8-9 combined schools listed for the King Sectionals but they could not field enough interests and dropped the program. I can’t see the MPS conference commissioner going for such an idea. Next year I heard that a few smaller D2 MPS schools will combine and that will shake things up for the 2017 sectionals in the Milwaukee area. Would schools like Albany and Peshtigo complain if they had to go against schools like King? I’ll have to do my homework but I wonder how many high schools there are in MPS district and where they are located on a map? South Milwaukee Sectional has the other combined MPS schools Milwaukee Bradley Tech/Aububon/Golda Meir/Hamilton/Riverside/South). It would be great to see local and national shoe companies come and promote XC to these schools. Target the middle schools and elementary schools. Use the “Feeling Good Mileage” program to promote running on the school grounds. Get surrounding area athletes and coaches to come in to talk. Suburban schools can encourage the MPS schools to enter their meet. I allow a number of schools to enter our meet and I increased the number of medals so that more runners can earn something. A since of pride. If they have only one runner or are incomplete we may not even charge a fee. Talk to local running companies to see if they can promote in the city schools. Talk to the MPS Conference Commissioner to see if he or she can promote in the schools. I don’t have the answers but I do know that I will be sitting down with a few MPS coaches at the end of the season to see how I can help increase the participation number for the city schools. With Milwaukee King hosting a Sectional meet it may bring more awareness and news coverage. To my knowledge it’s been 30+ years since a “City” school has hosted a Sectional meet. Coach Zeise is passionate about the sport and he wants to see the City Meet increase in size. As for the huge coopted schools it’s hard to promote when you do not have the coaches in building representing your program. Seeing a person with a shirt, jacket or hat can make a difference. They are visible and the student body may have a bit more interest! I know that none of this will be an easy fix and it will take time! But it should not be ignored!